So given that we’re trying new cooking techniques this month, one of the ones that jumped out at me was kinpira, a Japanese technique involving a quick stir-fry followed by a braise, most commonly used on root vegetables. Now, I’ve likely done something like this at some point, but not on purpose as a technique. Since the technique itself seemed pretty simple, I thought I’d amp it up a bit and also find a new-to-me vegetable: enter burdock root. Burdock root is an odd root to work with, at least in this experience. It’s rather slimy when slicing, so be careful and use a sharp knife. I think that likely explains why you then soak the “matchsticks” (try as I did, my knife skills weren’t quite up to perfect julienne this weekend) before cooking them. In this recipe, the burdock is mixed with carrot, which seems common. The recipe is a quite complex-tasting vegetable side dish, which surprised me given how simple it was. But the seasonings let the vegetable flavors come to the forefront (behind a bit of saltiness from the tamari or faux soy) and they are quite good. And that is generally my experience of Japanese food — all techniques and seasonings seem designed to remind you why the main ingredient is a wonderful flavorful part of the world. As the technique and root were both knew to me, this is not an original STFAA recipe. It is very slightly modified from a recipe at JustBento.com, a site which is inspiring lunchbox shopping needs like you would not believe. 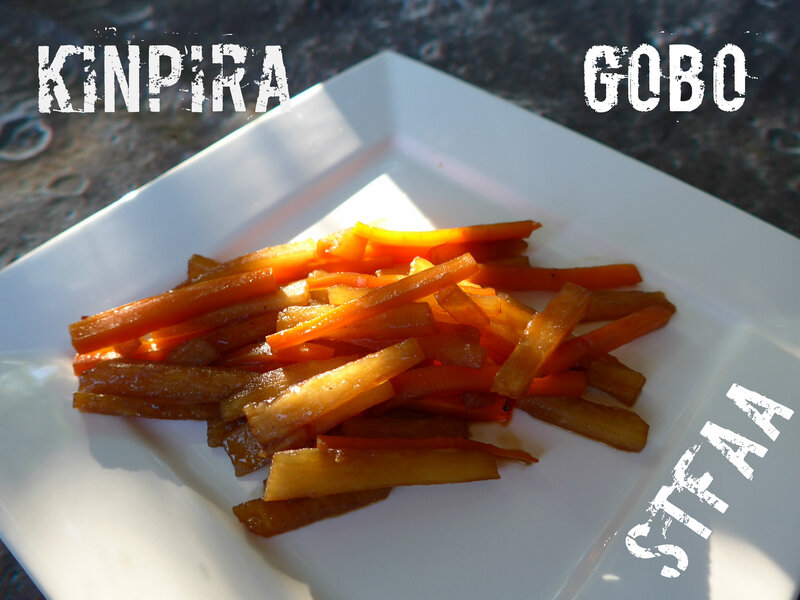 The original kinpira gobo recipe is here. This is a very slightly modified version of the Kinpira Gobo recipe at JustBento.com. All photos, opinions, and modifications are mine. Wash, peel, and chop burdock root and carrots into matchsticks or julienne. Soak the burdock root in cold water for a few minutes, rinsing and changing the water once or twice. In a cast iron skillet, heat up the sesame oil or other high smoke point oil over medium heat. When oil is hot, add burdock and stir well. Let cook for 1-2 minutes, then add carrot and stir well. Add other seasonings. Stir well and cook another 1-2 minutes. Add water, if needed to coat the bottom of the pan with a shallow layer. Reduce heat to medium low and simmer for 5-10 minutes, until vegetables are tender.